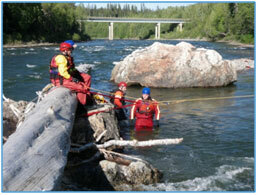 This swiftwater course certified by Rescue Canada is open for registration! We'll get you out on local rivers, learning to understand river hydrology, rescue yourself or others in case of emergency, and how to work safely and make good decisions in a river environment. Includes 2-4 hours of e-learning in advance of the course dates. For more details check out OVERhang's swiftwater page. The course price is $369 per participant ($259 for a recertification) plus tax; register by May 13th. Additional costs: drysuit rental at $50/day, and shared shipping to bring up all the equipment, course materials, etc (averages $20-40 per person, depending on number of course participants). By registering you agree to the cancellation policy below. Cancellation Policy: due to the amount of planning, preparation, and shipping of gear involved, we require a minimum four (4) days notification before the outing in order to provide a refund. Extenuating circumstances may apply; please be in touch as soon as possible. Email us with any questions or to schedule another course a different day!